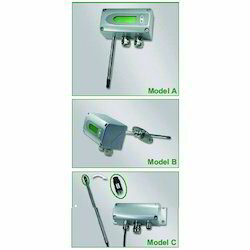 We are engaged in offering a very highly premium and excellent quality range of Air Velocity Transmitter. These Temperature & Air Velocity Transmitter are built to measure air velocity with hot wire in constant thermal equilibrium. Our range is available at market's most leading price. Air Velocity Transmitters are ideal for accurate ventilation control applications. They are operating on an innovative hot film anemometer principle. 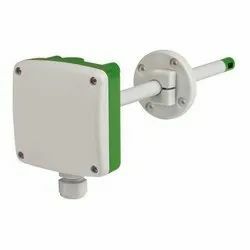 The E+E thin film sensor guarantees very good accuracy at low air velocity, which is not possible for conventional anemometers with commercial temperature sensors or NTC bead thermistors. Moreover, the Ei-E sensor is much more insensitive to dust and dirt than all other anemometer principles. This means high reliability and low maintenance costs. EE65 series are available with current or voltage output, the measuring range and the response time can be selected with jumpers by the user. Low angular dependence enables easy cost-effective installation. An integrated LC display and a version with remote sensing probe are available. We offer EE70 Series Air Velocity Meter. These are using ESE thin film sensors operating on an innovative hot film anemometer principle. This guarantees excellent accuracy in the low range, even below 0.5 m/s. which is not possible with conventional anemometers with commercial temperature sensors or NTC bead thermistors. Furthermore. the E+E sensor is much more insensitive to dust and dirt than all other anemometer principles. which increases reliability and reduces maintenance cost . 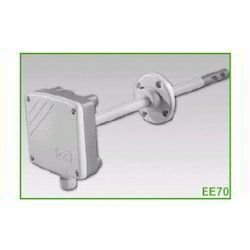 EE70 Series are available with current or voltage output and also as a version with remote sensing probe. Very low angular dependence enables easy cost-effective installation. The Velocity Transmitters were developed to obtain accurate measuring results over a wide range of velocities and temperatures. A high-quality hot film sensor element based on cutting-edge thin film technology ensures maximum sensitivity. even at lowest mass flows. The integrated temperature compensation minimizes the temperature cross-sensitivity of the EE75 series which, combined with the robust mechanical design. In addition to air velocity and temperature values, the transmitter calculates the volumetric flow rate in m3/h or ft3/min. The cross section of the duct needs to be determined for this purpose and the volumetric flow rate can be displayed and directed to one of the analogue outputs. The configuration software included in the scope of supply allays to choose the appropriate output parameter and freely scale the display range arid signs level of the two analogue outputs. In addition user-friendly calibration of the air velocity and temperature and the adjustment of key parameters (e.g. response time of the velocity and temperature lay flow cut-off points, etc. are supported as well. An optional illuminated display with two control buttons integrated in the cover is available. In addition. this enables changes of the configuration to be made directly on the unit. 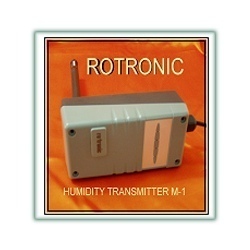 The Rotronic M-Series Humidity Transmitter feature the proven housing with base plate and cover. Our range is known for its excellent quality and high performance. Our range is highly appreciated by the clients in all over the nation and available at market's most leading price. Looking for Air Velocity Transmitter ?